Recovered Ebola patient, Aline, tells us about her own experience as an Ebola patient and walks us through the Mangina Ebola Treatment Centre in the Democratic Republic of Congo sharing what it’s like to be admitted and treated. My name is Aline Kahindo Mukandala and I’ve been cured of Ebola. I’m putting these clothes on because I want to enter the high-risk area to look after the children. Follow me. Come and see where I was admitted and cured. Come on, let’s go. This is where they take the blood sample. They take it to the laboratory. It takes an hour or two for the result to come through, to find out if it is negative or positive. Mine was positive. They took me to the confirmed cases zone. Come have a look. The nurses are dressed like that and I’m dressed like this because I’m cured. I can’t pass on the virus or be infected They’re wearing different clothing because they can be infected by the disease. This is where we change out of our clothes so we can leave without taking the Ebola virus home with us. People must protect themselves against this disease. 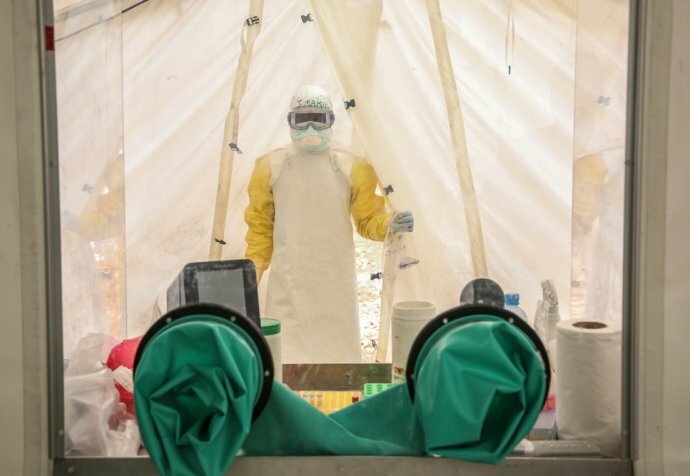 MSF participates to the outbreak response with several teams deployed across the North Kivu and Ituri provinces.